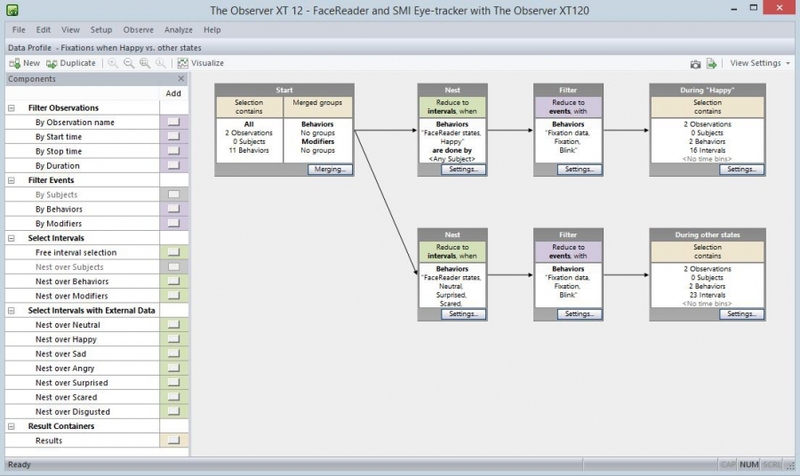 The Observer XT: sophisticated data selection, clear visualization of data, powerful data analysis, versatile, and with many export and import functions. The Observer XT publications over the years. Source: Google Scholar. The analysis of data often begins with visualizing the event log, one or more videos, audio, and physiological data streams. All data streams are displayed alongside and play in perfect sync. Visualization creates a direct reference between video, audio, and other data: a great tool for quality improvement. Continuous recording - the track of continuous scored events is visualized as a horizontal bar in which different colors represent different active states. Instantaneous sampling - samples are visualized as dots. The colors correspond with the colors of the continuous scored behaviors and can thus be compared easily. The software provides you with a list of all the events that meet your criteria. This list contains start times, stop times, and durations of each event. You can click on the result and be brought to the right observation, or export the list of results to a spreadsheet program of your choice. You can build elaborate filters based on combinations of independent variables, behaviors, physiological data, and time criteria, such as behaviors being active, or select subjects by independent variable. The independent variables are for labeling and filtering: for example treatment, subject ID, observer, and any other important circumstances. All data in the project is available for analysis at all times. Extract only the relevant bits for each research question. Filter out the relevant data with the powerful and intuitive graphical data selection tool. Select events based on their duration. Analyze large groups of observations at once, saving a tremendous amount of time. Copy data profiles. For example, easily copy-paste the same selection boxes for male subjects as you had already designed for female subjects. The Observer XT offers descriptive statistics of the coded behavior. Among the possible output are tables of frequencies, durations and other statistics, interaction matrices, and transition matrices. Next to that, synchrony and learning curves are analyzed. Moreover, it is with The Observer XT you can perform a lag sequential analysis to analyze the order of events. "Noldus has saved me scores of time! I have cut my analysis of observations in half, I am able to immediately transfer raw data to statistical packages, and can review records with ease" [David Rudek- USA]. You can also perform latency analysis. Response latency is the time between the onset of a stimulus and the initiation of the response. This latency analysis in The Observer XT enables you to investigate the relation between stimulus and response in depth. Build elaborate filters that provide you exactly the data you are after. The Observer XT allows you to create pie charts, scatter plots (with trend lines), or other visual representations of your results. You can easily use these illustrations for presentations purposes. Save the graph and present it in your PowerPoint presentation or research article. You can also take a snapshot of your event plot, with just a push of a button, and use this in your report or presentation. In collaborative projects it is vital to avoid observer bias. An important tool to detect this, is reliability analysis: observations by different coders (inter-rater) are compared record by record and the software reports Cohen’s Kappa, along with a listing of agreements and disagreements. Reliability analysis is also used for intra-rater reliability, as a basic quality check. Comparison list The Observer XT . Introduced in version 11.5. Reliability analysis output includes a confusion matrix in which you can easily spot the disagreements between two observers (or observations of the same scene). You can compare an unlimited number of pairs, and each pair is presented separately so that results are clear and quickly available. You can compare observations with four different methods: Event frequency/sequence, event duration/sequence, event frequency, and event duration. The comparison list is linked to the video, clicking in event allows you to see the point in the video it refers to. Easily integrate physiology, coded events, facial expressions, eye tracking data, and many other data streams. The export to Excel functionality has been optimized, allowing you to export directly from the observation and analysis. By merging header rows, Excel format files can be imported directly into SPSS. This saves valuable time, eliminating the need to adjust the data. A Software Development Kit (SDK) is available for developers who want to build their own modules or interfaces with other systems.